I recently reviewed the Mio Alpha 2 – its unarguably the watch that brought optic HR to the mainstream…But I wasn’t overwhelmed by it. The sensor is good, but the watch, below average, and if you are happy with your sports watch, that’s a hard sell. 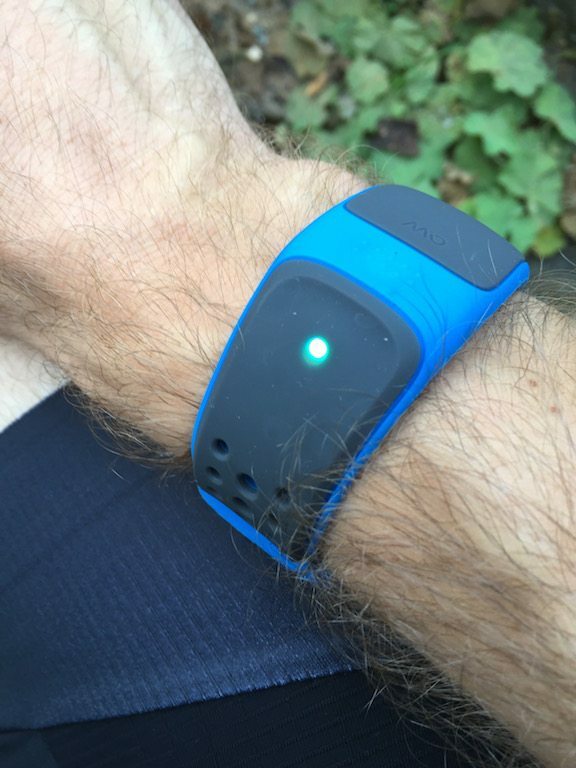 As a result Mio have focused solely on the heart rate function for the Mio Velo. So have a relegated my chest strap to the bottom of the sock draw…? Lets find out! On of the biggest failings for the Mio Alpha 2 is its lack of ANT+, instead opting for only Bluetooth Smart. Neither communication is the defacto standard and in many ways, different groups look to one or other of the communication standards. 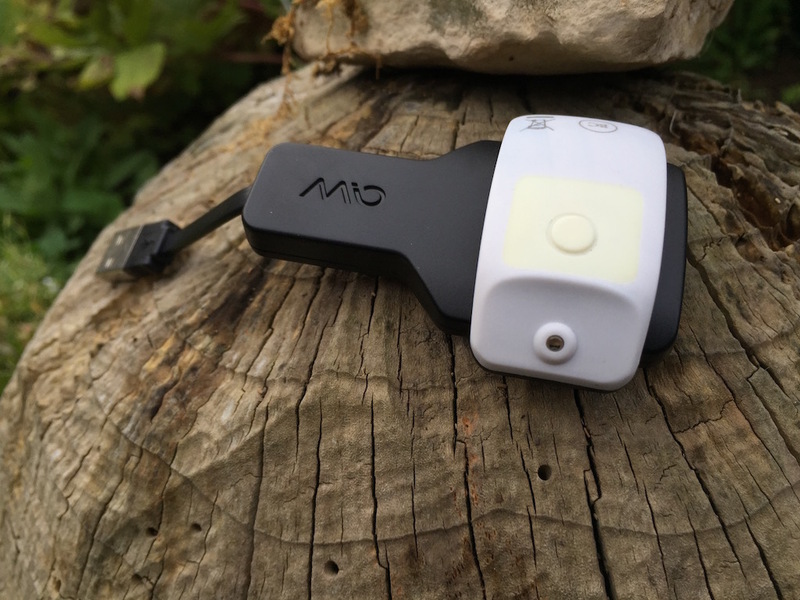 Mio has looked to address the lack of ANT+ with their release of the Mio Velo, not only by adding in dual broadcasting across both ANT+ and bluetooth, smart but also adding in a bridging ANT+ function, which I’ll address shortly. 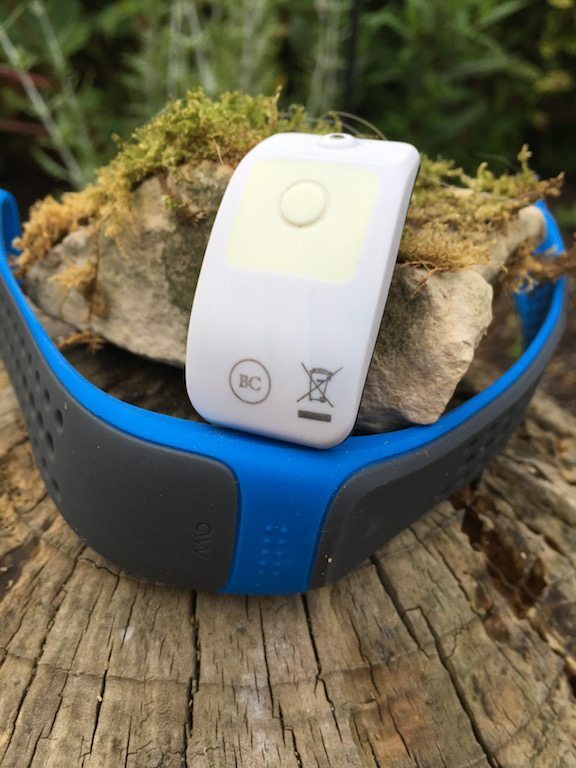 In exchange for the wireless goodness, Mio has seen to omit a screen from the Mio Velo plus running metrics, such as distance and cadence. I don’t think this is a major omission. In fact I personally feel is focuses the Mio Velo to its function – basically replacing your heart rate strap when on your bike – and actually results in a better product than the Mio Alpha. The Mio Velo is a eye catching sky blue, with grey cladding to the band. There is very little actually on the band, and certainly no screen. 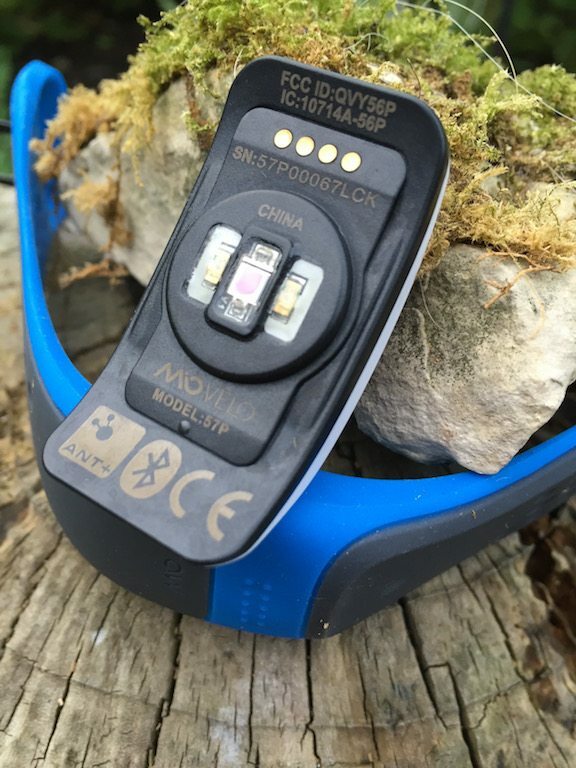 In fact the brains of the device are not even exposed to the user directly – yes the back is pressing on the skin – but even the single user interface button is hidden under the silicon band. On the inside of the device is the Mio/Philips sensor, and the four little charging plates. Unfortunately the charging plate is different to that on the Mio Alpha, so again, its a single proprietary charging system. Yes its a constant bug bear of mine. WILL SOMEONE PLEASE COME UP WITH A STANDARD…AND USE IT! Overing away from the “device” Mio have kept the same band design as used in their other products, which is great. I dont think its over stepping the mark to say that in my opinion Mio’s band is the best in the market currently – its just so comfortable! 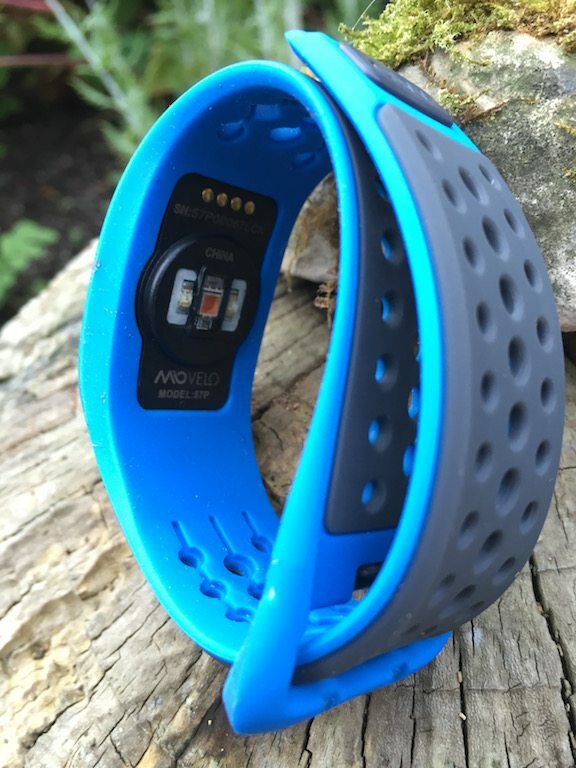 Possibly because it is so pliable, the band conforms to the contours of your arm. 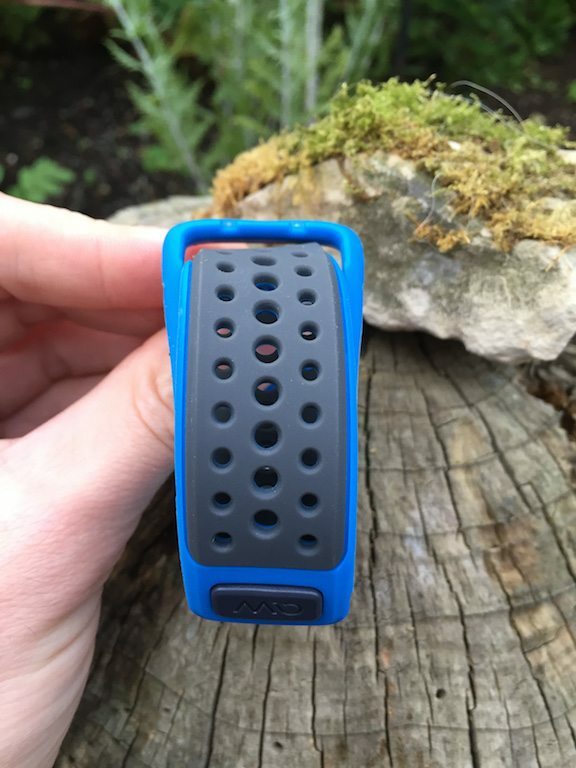 The band is a soft rubber, than stretches easily, allowing a firm, but not too tight grip around your wrist. A little like the Velo’s chest strap fore-fathers, the actual heart rate monitor, the brains of the Mio Velo slips out very easily, for charging or cleaning. Giving a rubber strap a quick wash and rinse is SIGNIFICANTLY easier than the “Wash after every 8 uses” on Garmin chest straps. Which you then have to wait for them drying. 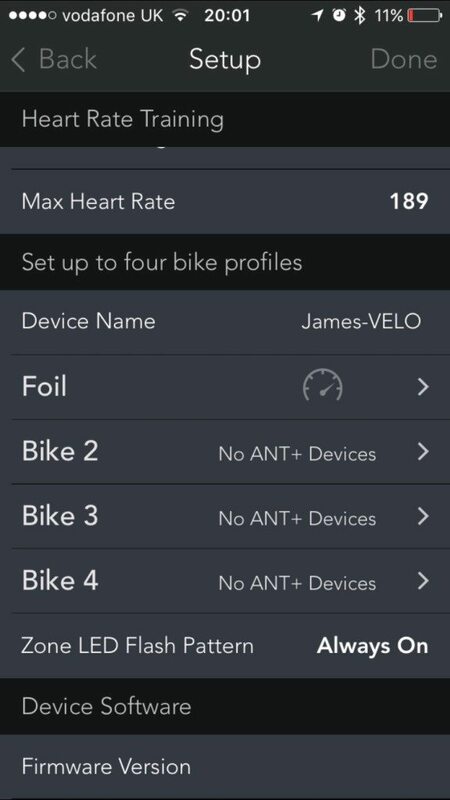 The lack of screen does mean that you are required to use the App a little more than with a normal HR device…but that doesn’t matter, as when I’m using HR data, its usually whilst on a run/cycle, and I’m looking at a watch or bike computer for the extra data. The Mio Alpha 2 was a great way to record HR, but a naff sports watch. Sorry. I have my own favourite watch, and devices that I tend to use. Giving me comfortable HR data is one thing, but that on its own is not compelling enough to make me take of my regular watch or device. However by REMOVING the screen, sliming down the functionality, and dropping the price Mio have actually made a device I really want! I can get rid of my chest strap (until is really cold anyway), and certainly when cycling indoors, the Mio Velo is much preferred. 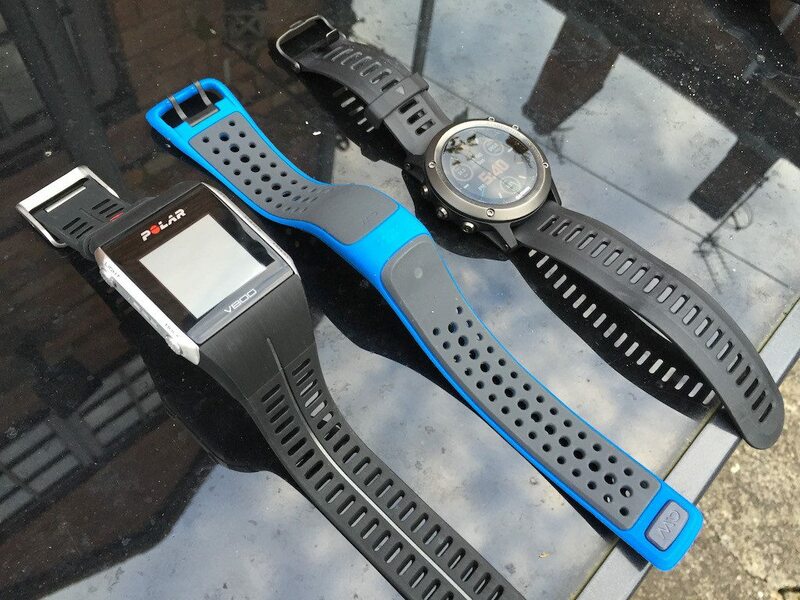 Acting as an ANT+ bridge means that the Mio Velo can take data from ANT+ speed/cadence units on the bike, and re-broadcast them to Bluetooth only devices, such as smart phones and other Bluetooth only devices – such as the Polar V800 watch. This is very useful as it means, for something like the V800 watch, as I can still use its triathlon/cycling functions with my existing ANT+ cycling sensors. Conversely it also means I can leave Garmin’s chest strap drying at home, and use it with the Fenix 3 over ANT+. I’m very pro cross compatibility ? This can be useful if more than one person in the house wants to use the Mio (The GF has never been a fan of chest straps for obvious reasons), or conversely if you are one of those people able to conform to the Velomati rule of N+1 bikes! I find that I’m much more likely to reach for the Velo now when I want a straight forward HR monitor. Its more comfortable, and a lot simpler, be that going to circuits, or on the bike. I’ll be honest, the Wahoo’s tap to change music feature, tends to keep me using that for running though, whatever. 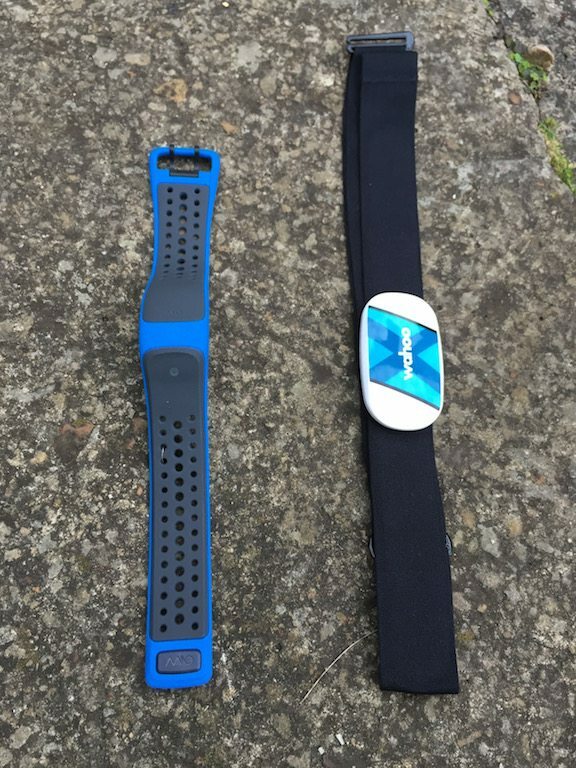 I’ve never had to swap the battery in a HR chest strap…now that might reflect my lack of exercise, or just the number of HR monitors knocking around the house. Thus I have been caught out once or twice with the slightly narrow 8hr battery life of the Velo. The Mio Velo unit is actually quite small. Certainly compared to the standard HR lozenge, so I think beefing up the battery would be entirely reasonable. Mainly as I think that an HR monitor, should have a battery life, equal to or greater than that of the watch its attached to. The Garmin 920xt has a battery life of 40hrs in UltraTrac mode, or 24hrs in other training settings. I think Mio should have strived to hit at least 24hrs before shipping the product. The secret to getting optical HR devices to work is to ensure there is not stray light getting to the unit, and the sensor is close to the skin. Mio have absolutely cracked this when it comes to straps and the Velo is no different. One of my biggest groans when about to start an activity is finding my chest strap from the day before is still wet and soggy. The Mio Velo completely overcomes this issue, and is probably more hygienic for it. The device is well priced, although I wonder how many people are going to need the ANT+ BRIDGE or the ability to link cycling sensors? The Mio Link has ANT+/Bluetooth Smart broadcast for £20 less assuming you already have a cycling head unit with sensors. The battery life is a little disappointing, but that probably reflect my lack of organisation that anything else. 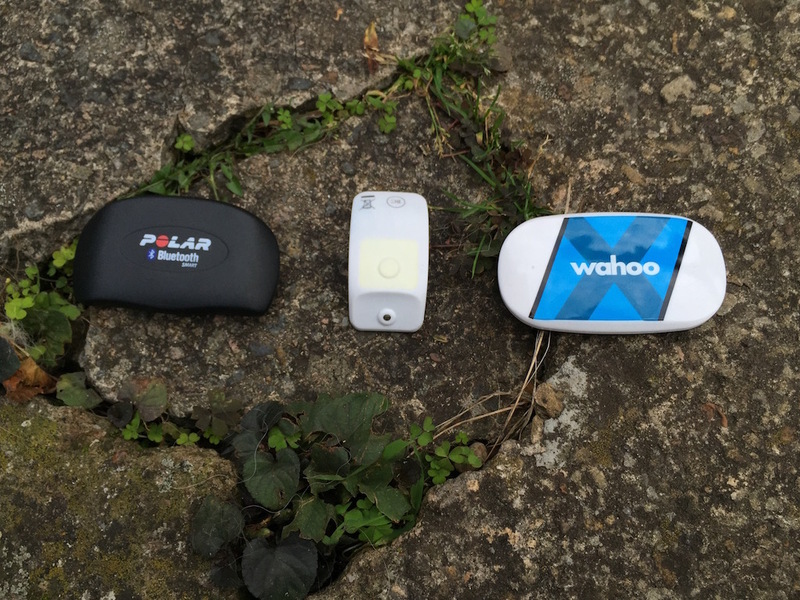 TacX Neo vs Wahoo KICKR – the show down!